Crevices and thin soil over rock and gravelly calcareous shores, in areas at least seasonally moist. 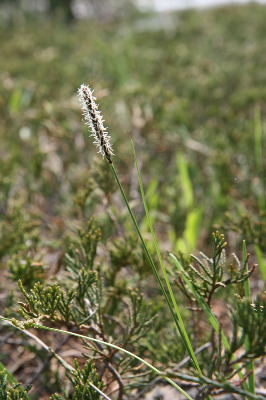 Plants of calcareous meadows, shores, and limestone pavement areas from Alpena, Chippewa, Mackinac, and Presque Isle Cos. are the Great Lakes endemic subsp. convoluta (Kük.) D. A. Dunlop, which has leaves of reproductive shoots less than 1.5 (–1.9) mm wide and usually looking even narrower because they are strongly folded (Dunlop & Crow, 1999). 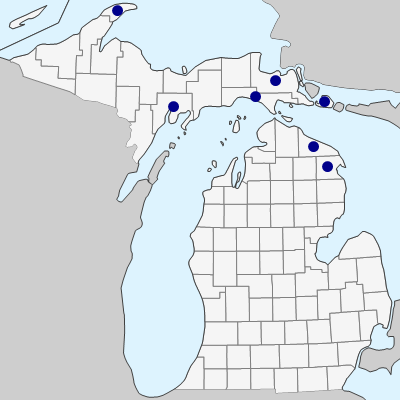 Collections from cliffs along the Escanaba River in Delta Co., and rocky shores in Keweenaw Co. are the transcontinental subsp. scirpoidea with ± flat leaves, the widest more than 2 mm wide. In this distinctive and rare species the scales of the pistillate spikes are dark brown to purplish; those of the staminate spikes may be nearly white. The spikes are normally solitary, but pistillate ones may occasionally have smaller lateral spikes below the terminal. MICHIGAN FLORA ONLINE. A. A. Reznicek, E. G. Voss, & B. S. Walters. February 2011. University of Michigan. Web. April 21, 2019. https://michiganflora.net/species.aspx?id=1045.